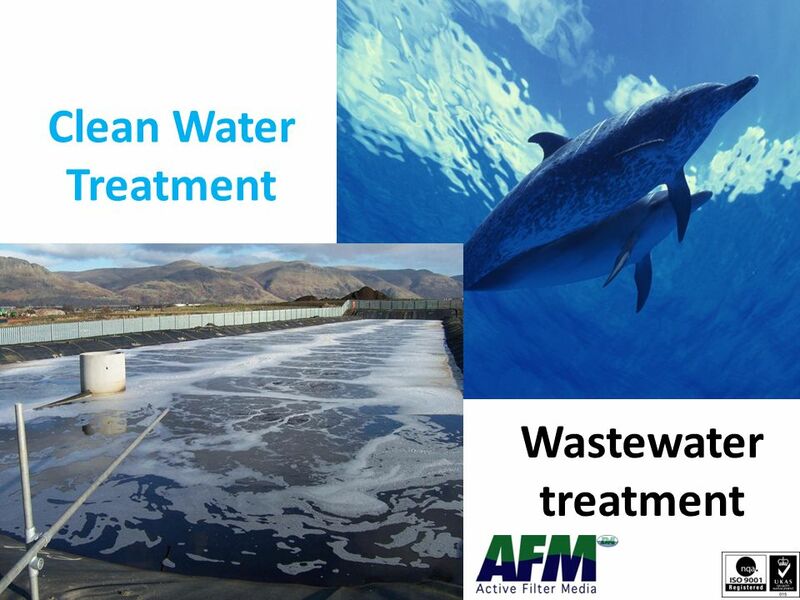 Clean Water Treatment Wastewater treatment. 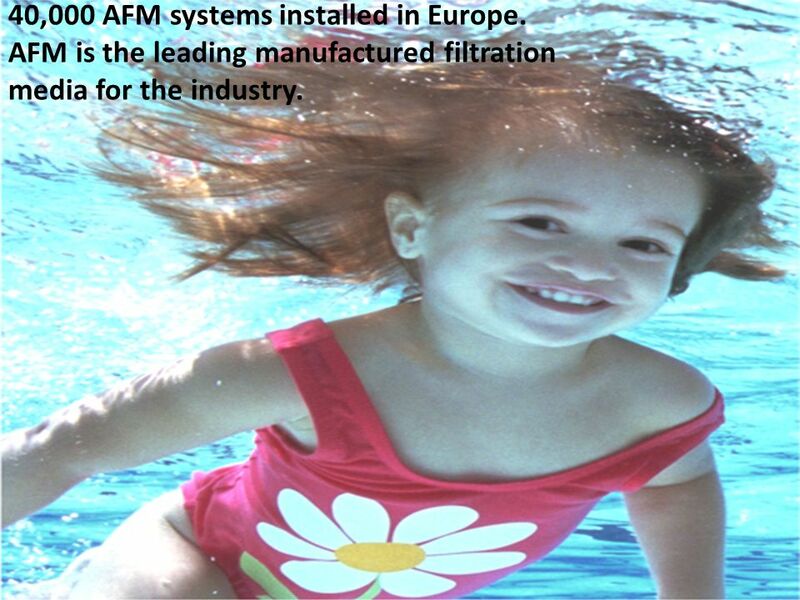 6 40,000 AFM systems installed in Europe. 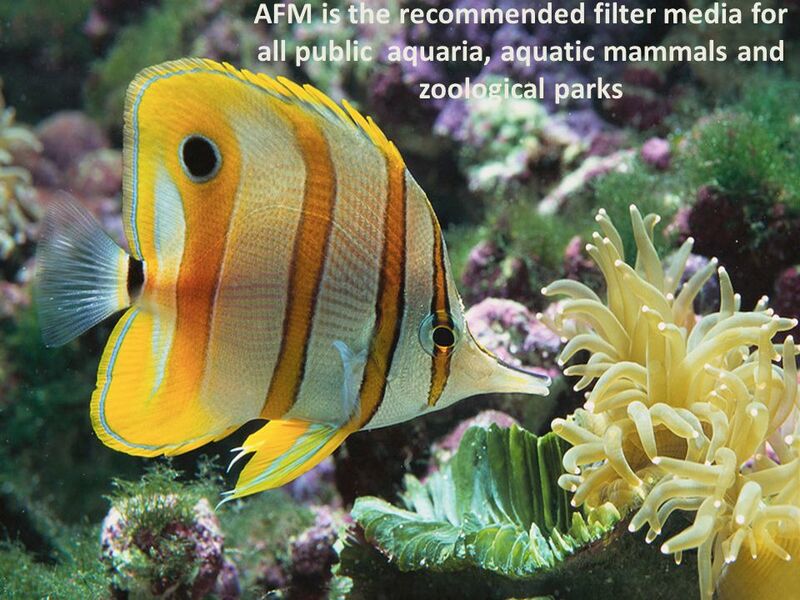 AFM is the leading manufactured filtration media for the industry. 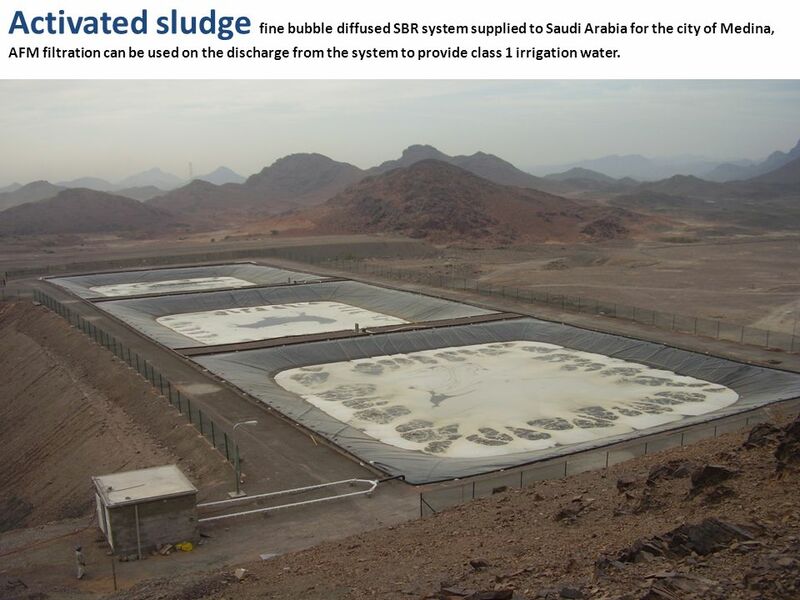 9 Activated sludge fine bubble diffused SBR system supplied to Saudi Arabia for the city of Medina, AFM filtration can be used on the discharge from the system to provide class 1 irrigation water. 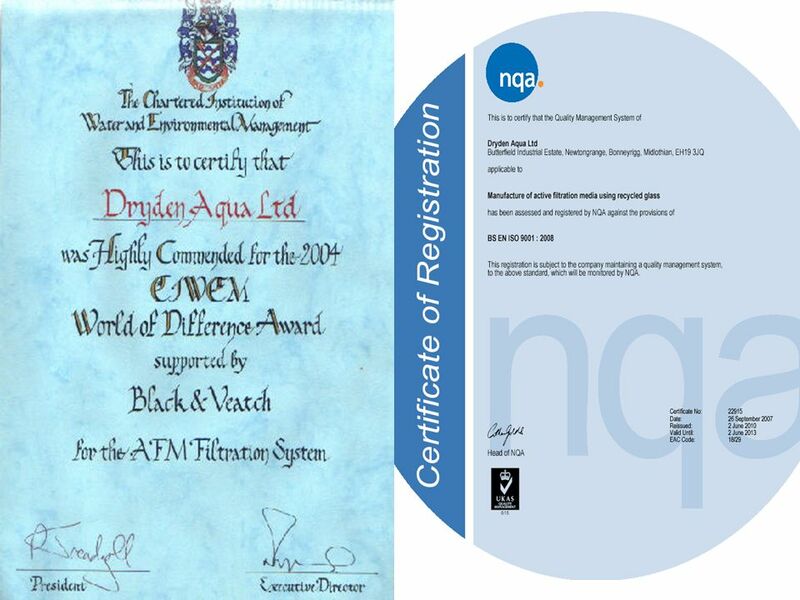 13 Direct replacement for sand in all types of sand filters, for clean water and waste water. 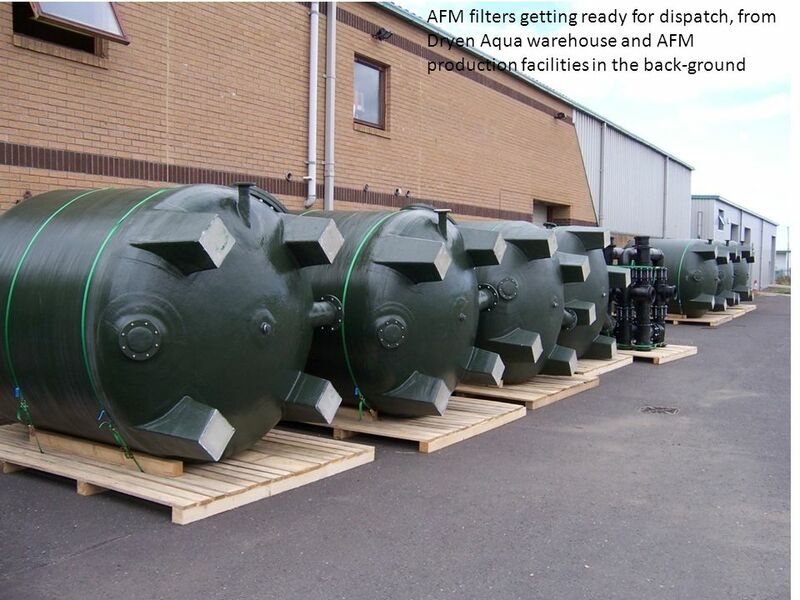 AFM may be used in existing pressure sand filters or rapid gravity filters There is no requirement to use moving bed filters, but AFM can also be used in moving bed filters to improve performance Bed depth 300mm to 1200mm Hydraulic loading, relates to solids load, usually around 5 m/hr, when solids are over 50mg/l. 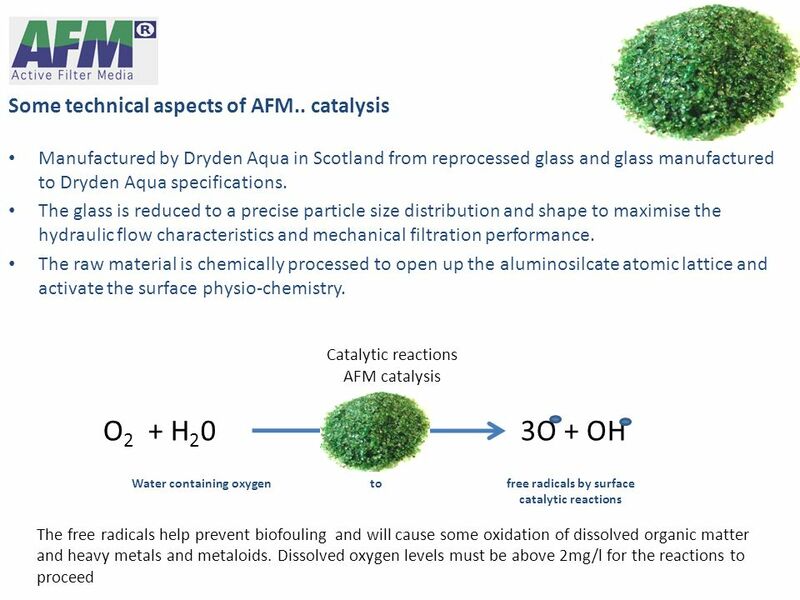 Under 50 mg/l SS, flows can be increase to 10 m/hr Back-wash at 55 m/hr after air scour AFM media will last for the life of the filters. Should never need to be changed. 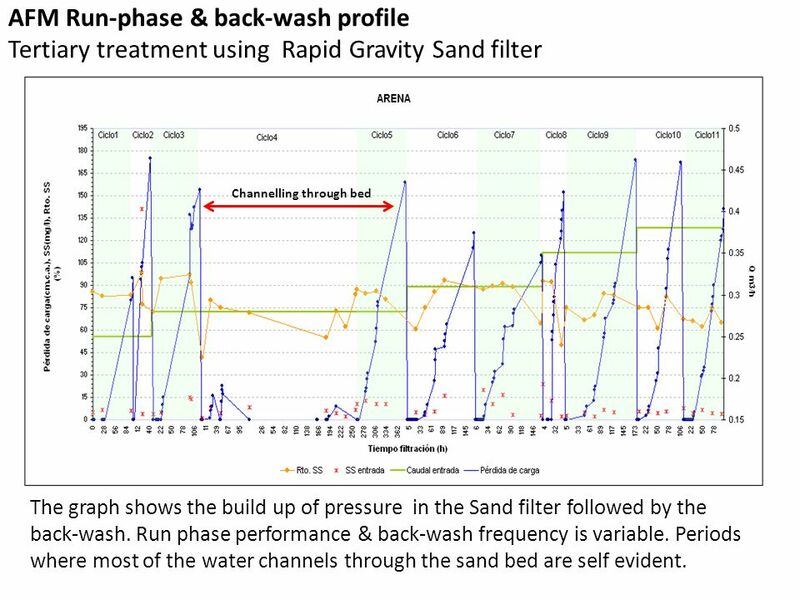 Channelling through bed The graph shows the build up of pressure in the Sand filter followed by the back-wash. Run phase performance & back-wash frequency is variable. Periods where most of the water channels through the sand bed are self evident. 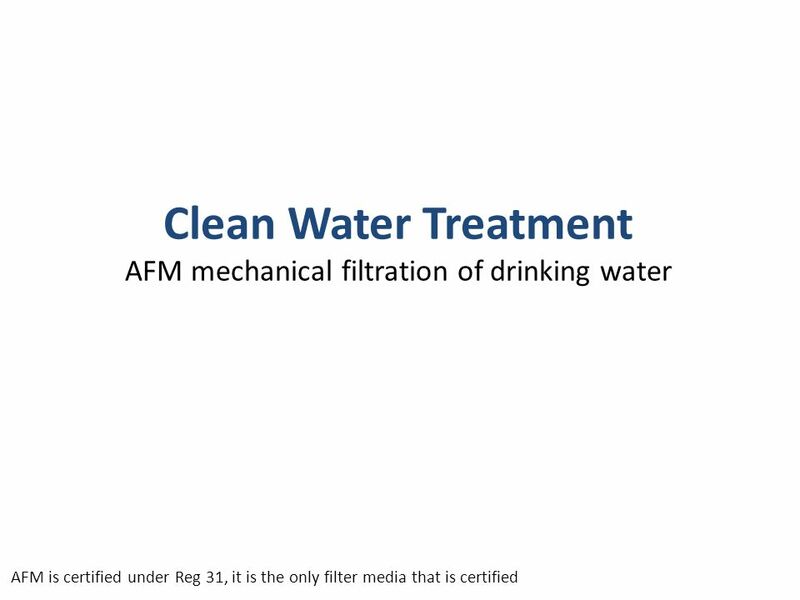 22 AFM removes chemicals AFM can perform well to remove chemicals such as ferric, manganese, TBT, copper, mercury, arsenic and PCB`s Works effluent AFM product water AFM back-wash 4.6 <3.8 6.3 4.5 11.1 5.2 4.0 10.4 6.1 9.9 TBT concentrations ug/l, from a working WWT systems. 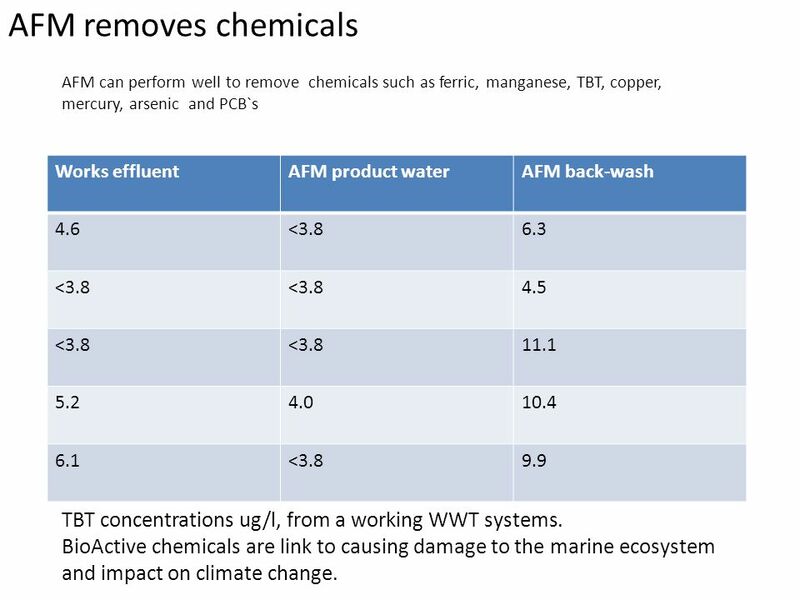 BioActive chemicals are link to causing damage to the marine ecosystem and impact on climate change. 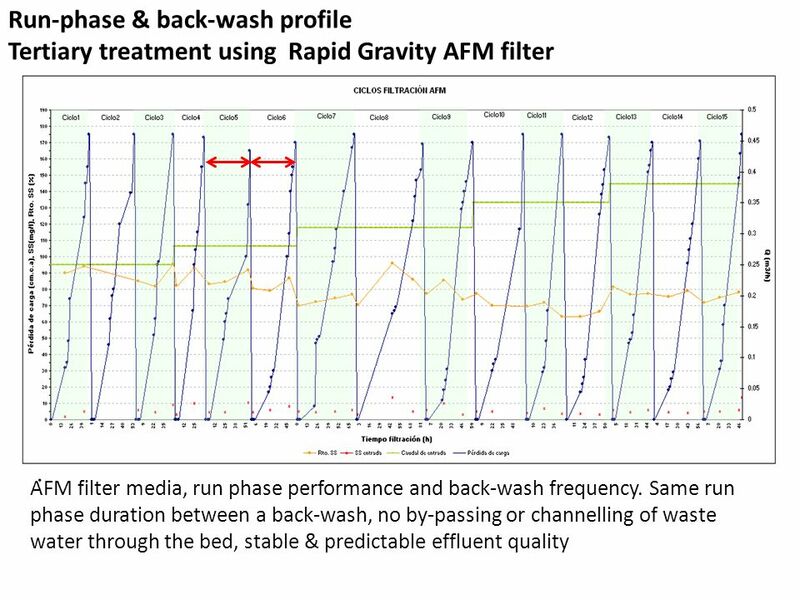 Trials conducted on parallel systems with AFM and Leighton Buzzard Sand What goes into a filter must come out in the back-wash The graph opposite is the back-wash profile for identical sand and AFM filters after 10 weeks. The profile shows that 30% more solids are back-washed out of the AFM. 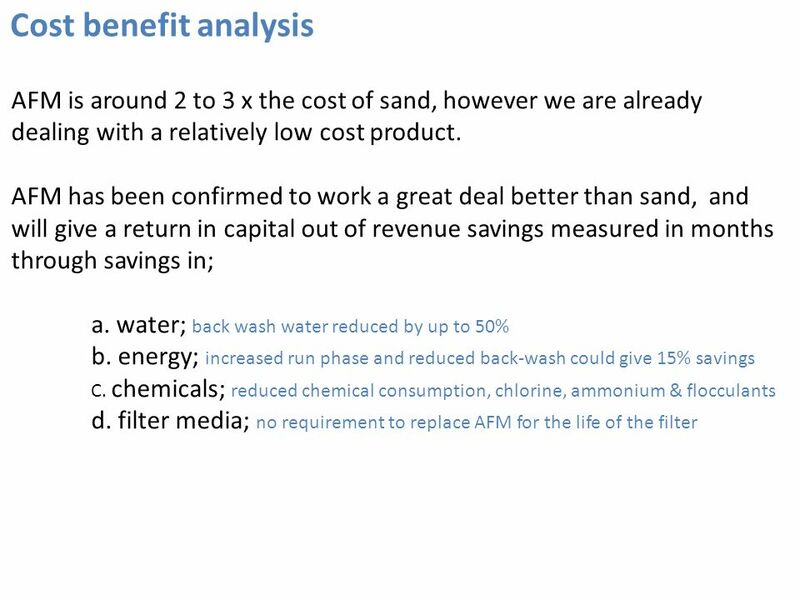 30% more solids have there been removed during the run phase AFM performance is maintained while sand filters continue deteriorate with time. 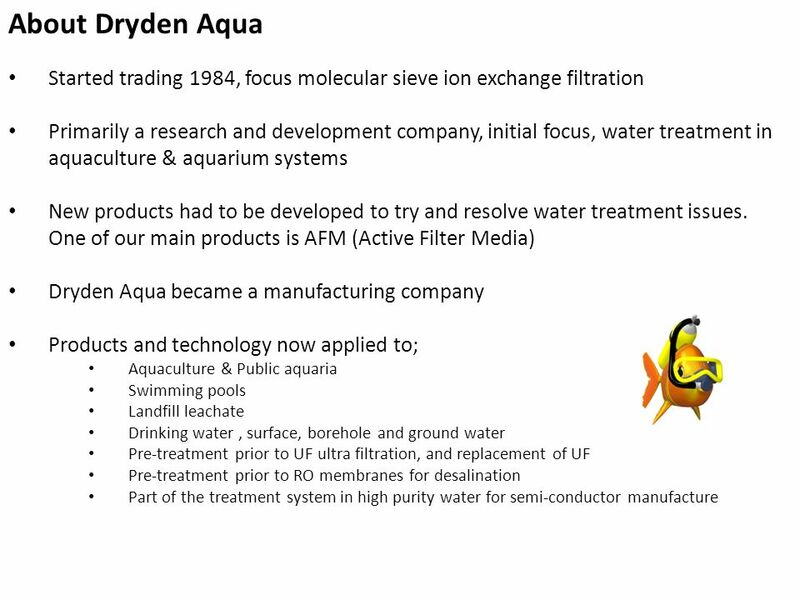 A high percentage of the chlorine is actually consumed by the sand filters, and changing to new sand can dramatically reduce the chlorine demand of the filter. A key point is that the more chlorine that is consumed in oxidation of the alginates and bacterial cell biomass, the more volatile chlorine and combined chlorine compounds produced, this is a straight stoichiometric equation Research supported by the European Commission over the last 5 years by Professor Alfred Bernard from the Catholic University in Brussels has shown, that there is a potentially serious issue with a link between high levels of volatile chlorine compounds in swimming pools and respiratory disorders such as asthma in children. The link hasn’t been categorically proved, but it is perhaps best to err on the side of caution, and give serious consideration to this point. Data from trials conducted by Suez Lyonnaise des Eaux 30% improvement after 10 weeks, 50% after 52 weeks. Plate count at 22 deg C. The linear trend line shows a 50% performance benefit over sand. 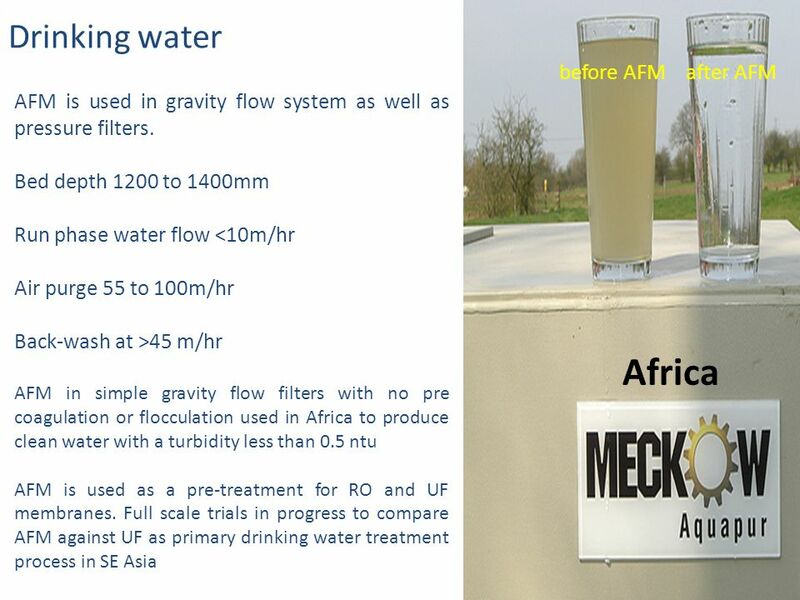 Plate count at 37 deg C confirm bacteria levels from AFM are half the level from sand filters. 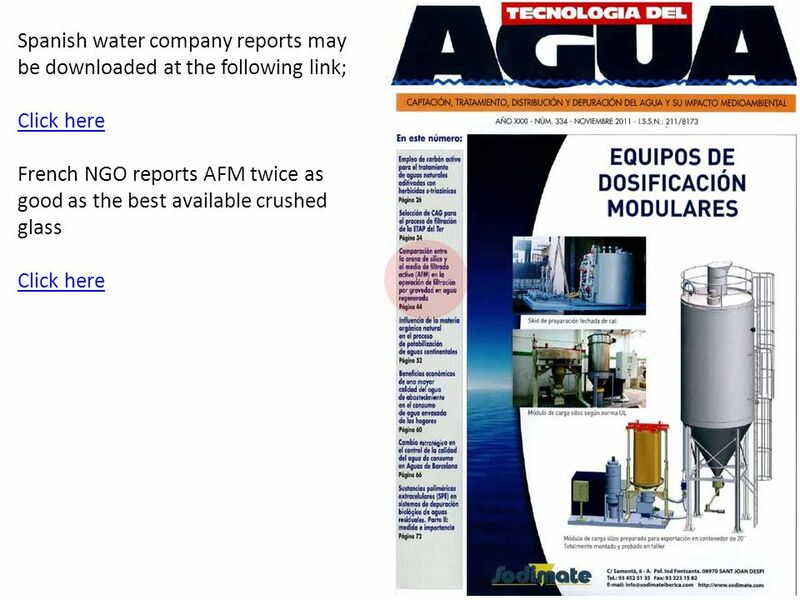 The data confirms the bio-instability of sand filters, and due to transient worm-hole channelling they may occasionally discharge into the product water. 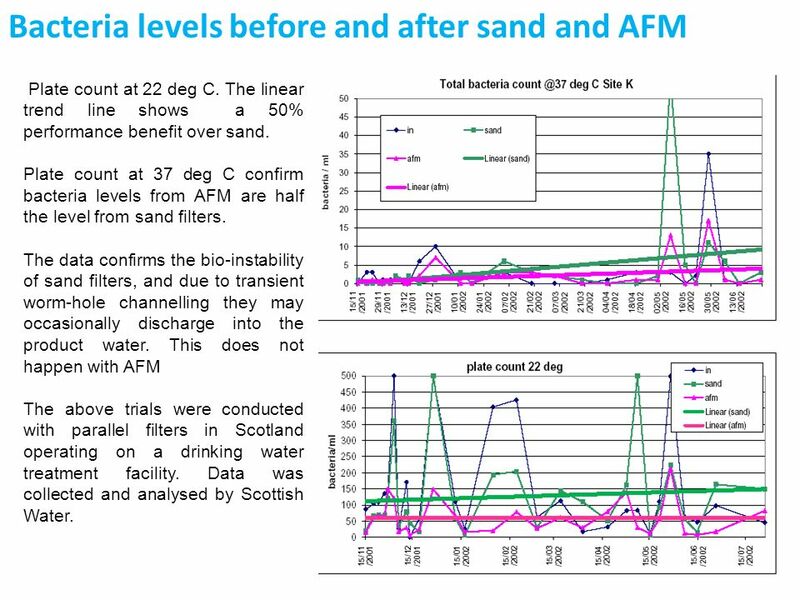 This does not happen with AFM The above trials were conducted with parallel filters in Scotland operating on a drinking water treatment facility. 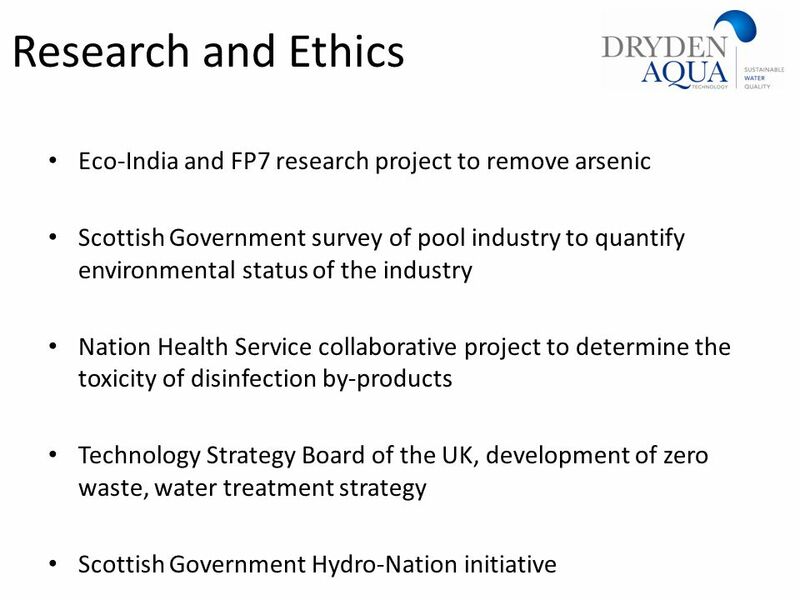 Data was collected and analysed by Scottish Water. 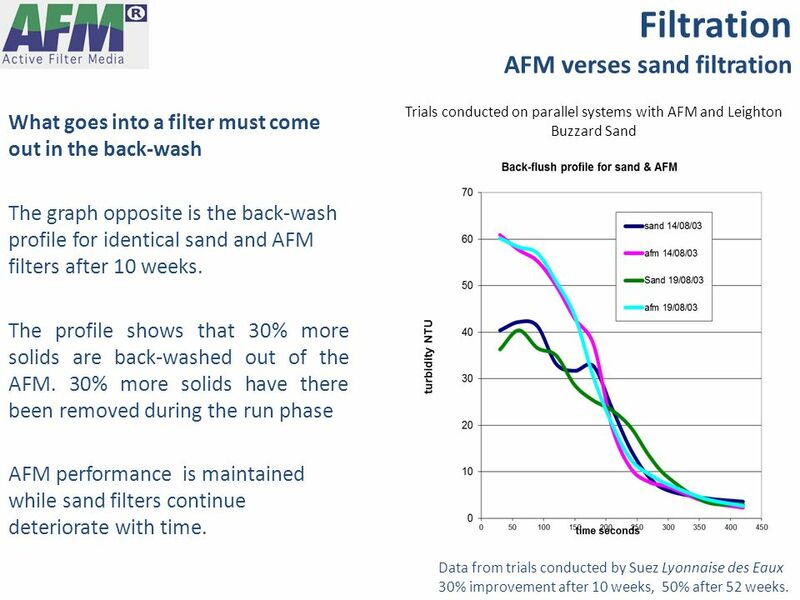 Iron levels, linear trend line confirms AFM performance is improving, sand performance is deteriorating over time. 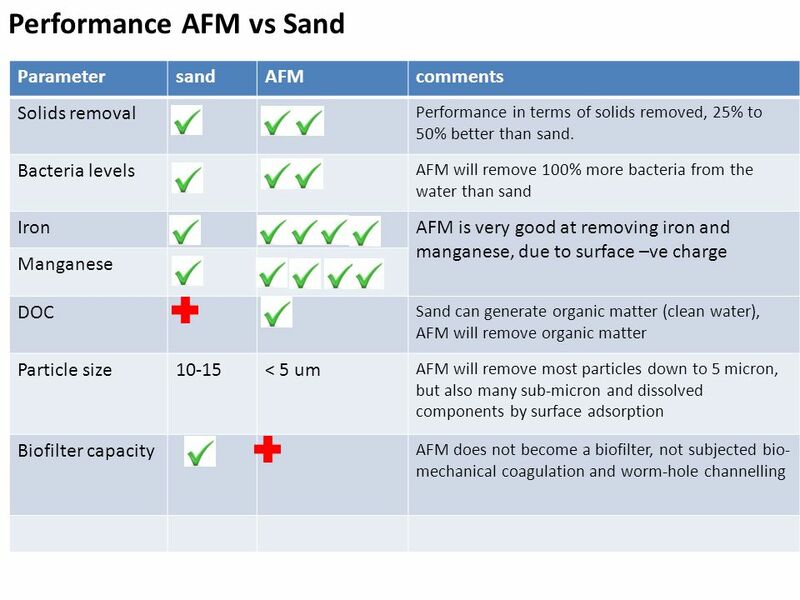 AFM performance twice as good as sand. 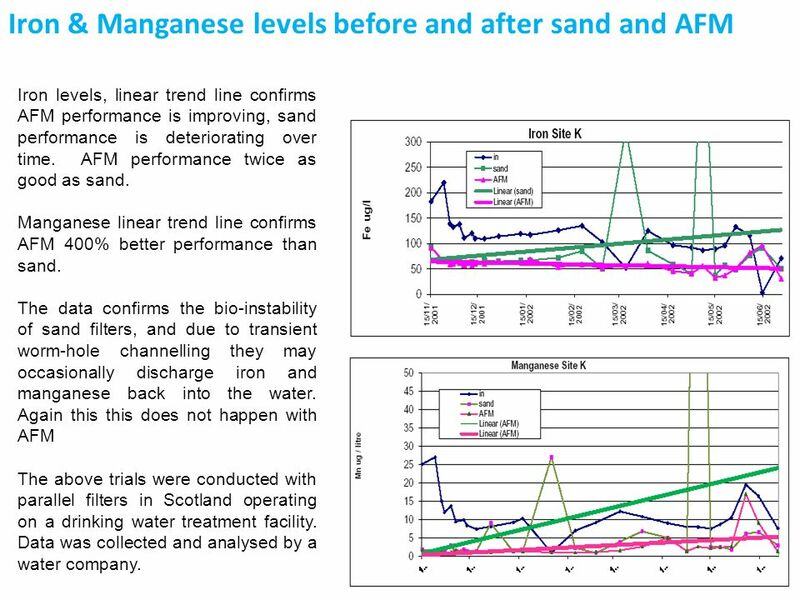 Manganese linear trend line confirms AFM 400% better performance than sand. 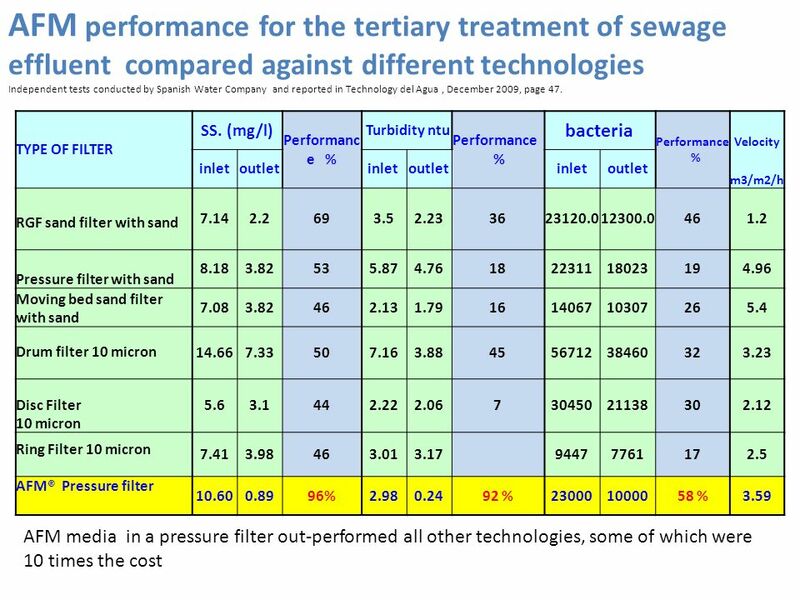 The data confirms the bio-instability of sand filters, and due to transient worm-hole channelling they may occasionally discharge iron and manganese back into the water. 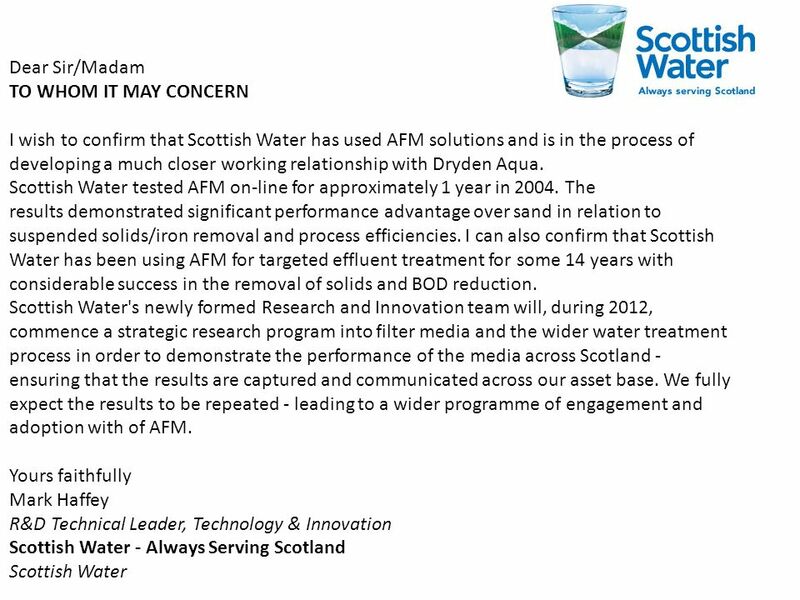 Again this this does not happen with AFM The above trials were conducted with parallel filters in Scotland operating on a drinking water treatment facility. 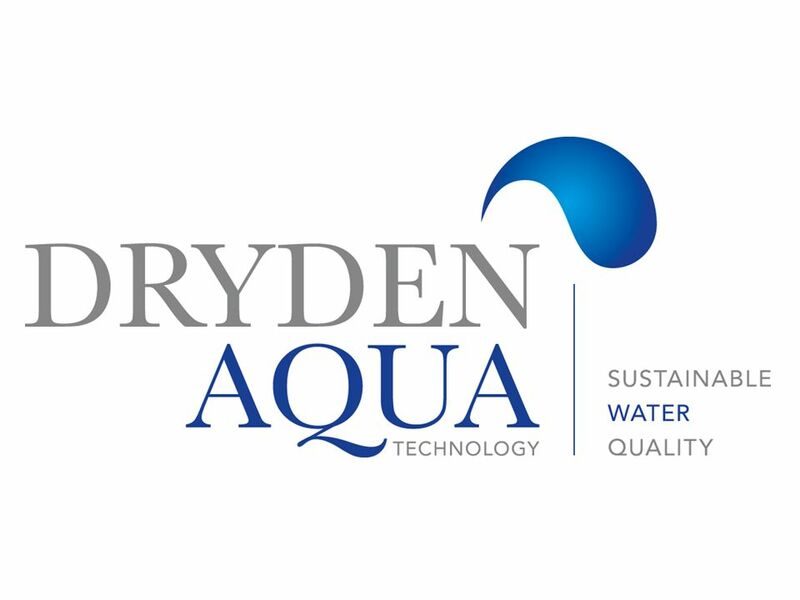 Data was collected and analysed by a water company. 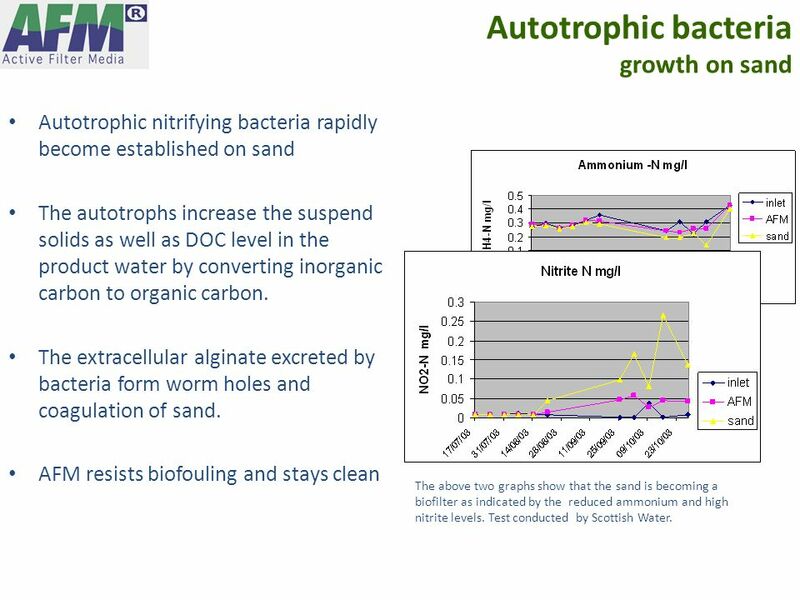 Autotrophic nitrifying bacteria rapidly become established on sand The autotrophs increase the suspend solids as well as DOC level in the product water by converting inorganic carbon to organic carbon. The extracellular alginate excreted by bacteria form worm holes and coagulation of sand. 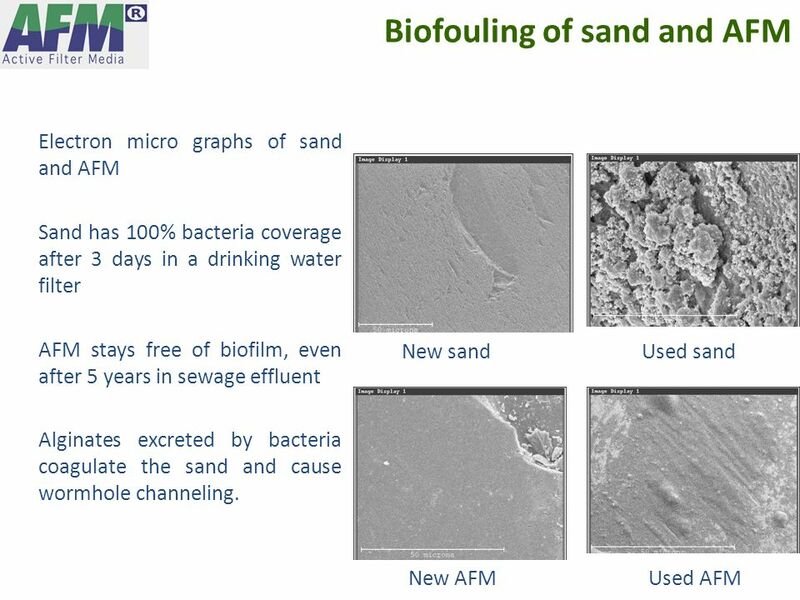 AFM resists biofouling and stays clean The above two graphs show that the sand is becoming a biofilter as indicated by the reduced ammonium and high nitrite levels. Test conducted by Scottish Water. 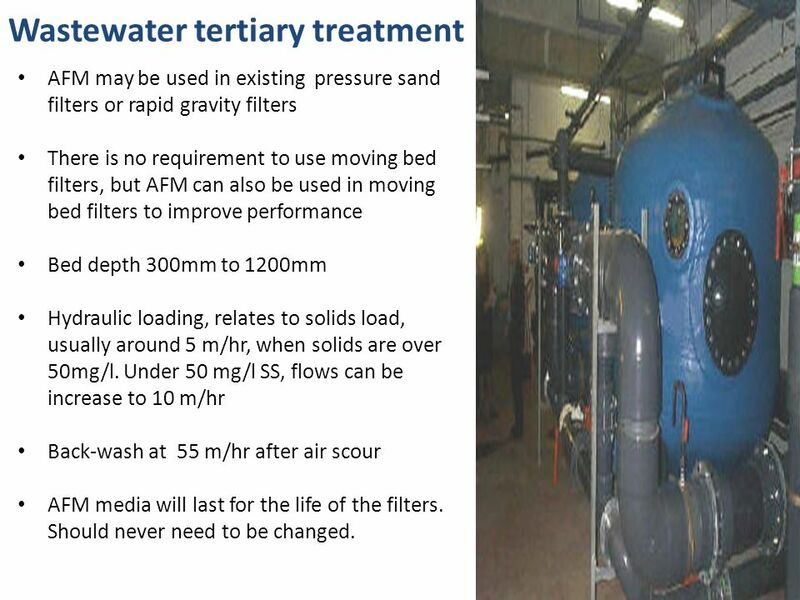 Sand filters are biological, bio-mechanical instability results in media coagulation, transient worm hole channel and discharge of solids into the product water AFM is electro-mechanical, media does not suffer from bacterial coagulation so no channeling of water through the filter bed. 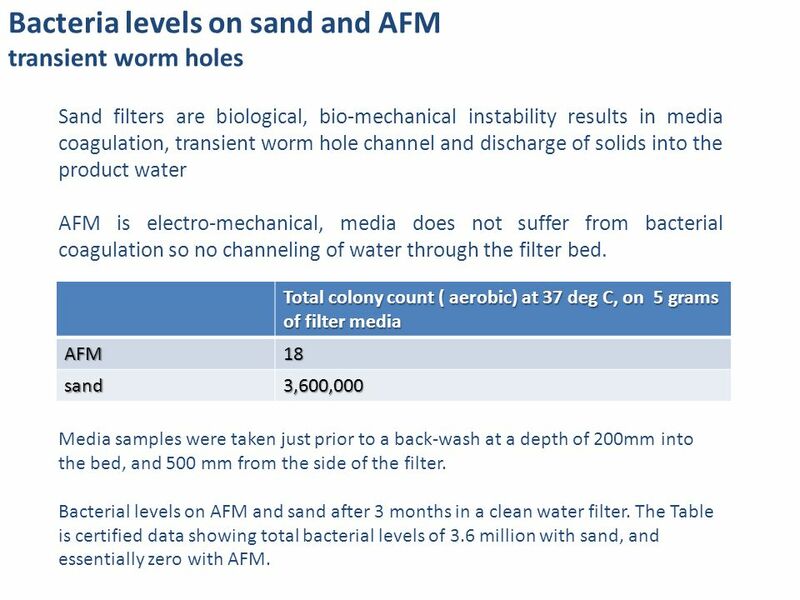 Total colony count ( aerobic) at 37 deg C, on 5 grams of filter media AFM 18 sand 3,600,000 Media samples were taken just prior to a back-wash at a depth of 200mm into the bed, and 500 mm from the side of the filter. Bacterial levels on AFM and sand after 3 months in a clean water filter. The Table is certified data showing total bacterial levels of 3.6 million with sand, and essentially zero with AFM. 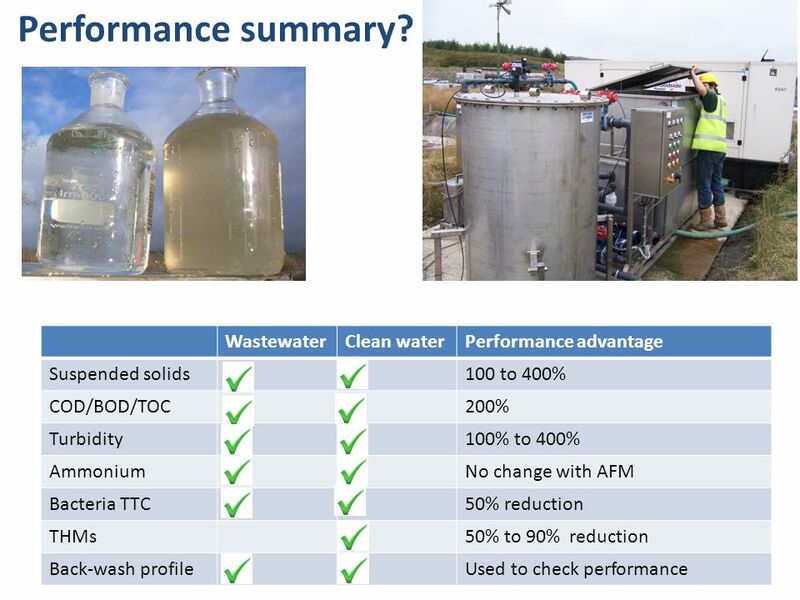 Typically improves performance by 30% to 50% in terms of solids removed for both waste water and clean water applications. 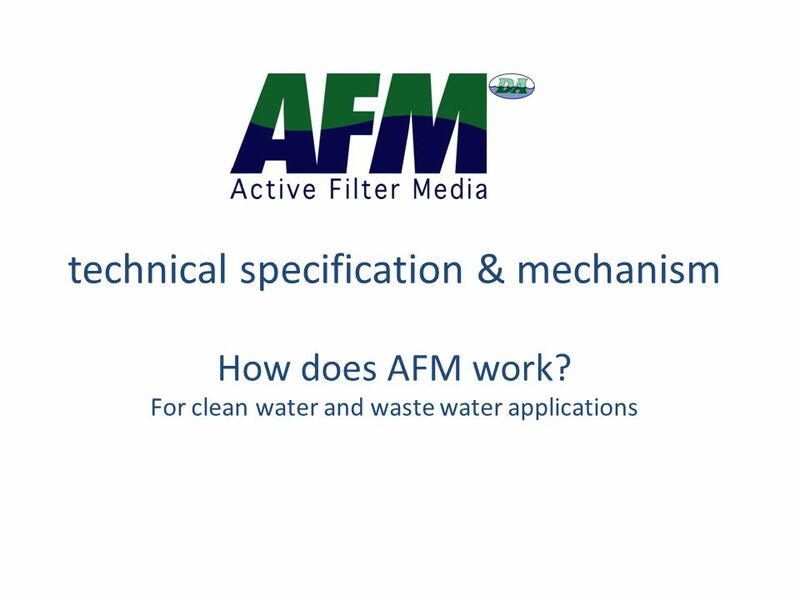 AFM does not need to be replaced, the media may be used for the life of the filter, and can be recycled and used again. 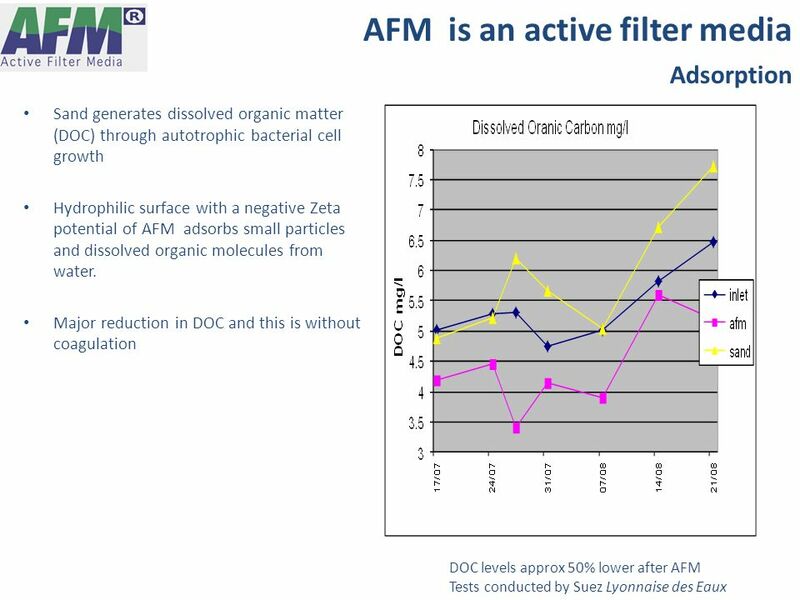 AFM does not bio-coagulate or experience worm-hole channelling. 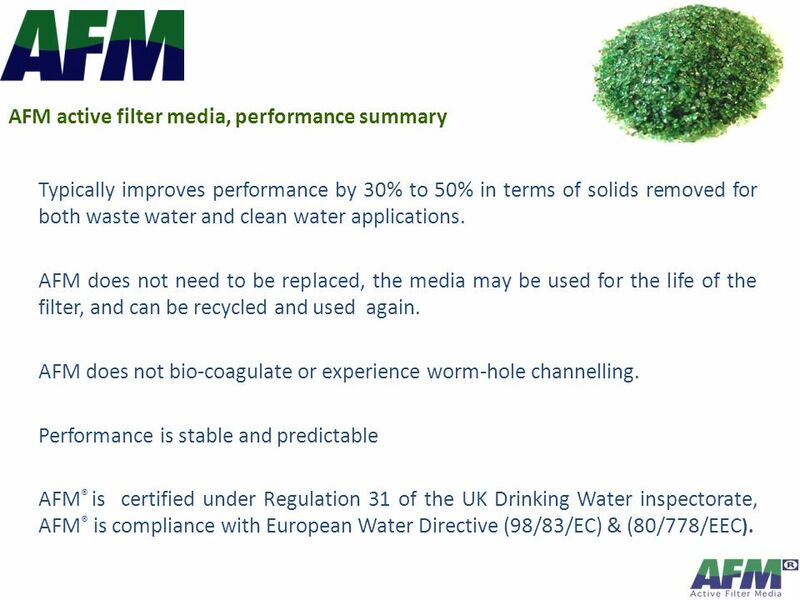 Performance is stable and predictable AFM® is certified under Regulation 31 of the UK Drinking Water inspectorate, AFM® is compliance with European Water Directive (98/83/EC) & (80/778/EEC). AFM mechanically removes most particles down to 5 microns. 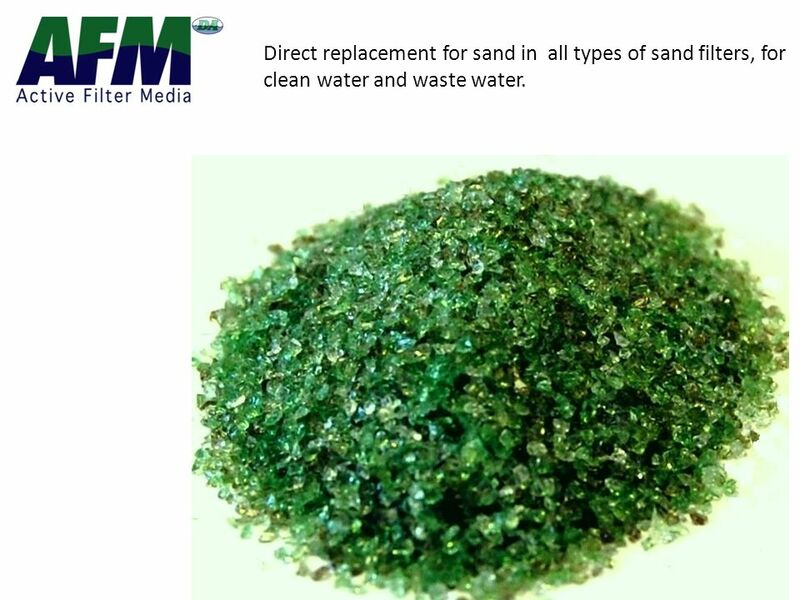 Sand surface area, approx 3000m2/tonne, AFM surface area >1,000,000 m2/tonne The high surface negative charge potential helps to adsorb micron and sub-micron particles as well as some dissolved organics Works synergistically with +ve charged cationic flocculants and polymers AFM rejects bacteria growth and worm-hole channelling -ve charge AFM surface stern layer (slip zone) predominantly divalent and trivalent cations Anion diffuse layer sulphate and bicarbonates Zeta –ve potential +ve cationic flocculated solids +ve charge coagulated and polar & dipolar dissolved organics Zeta Potential reactions on the surface of AFM and the behaviour of +ve and –ve ions as well as sub-micron particles and dissolved organics. 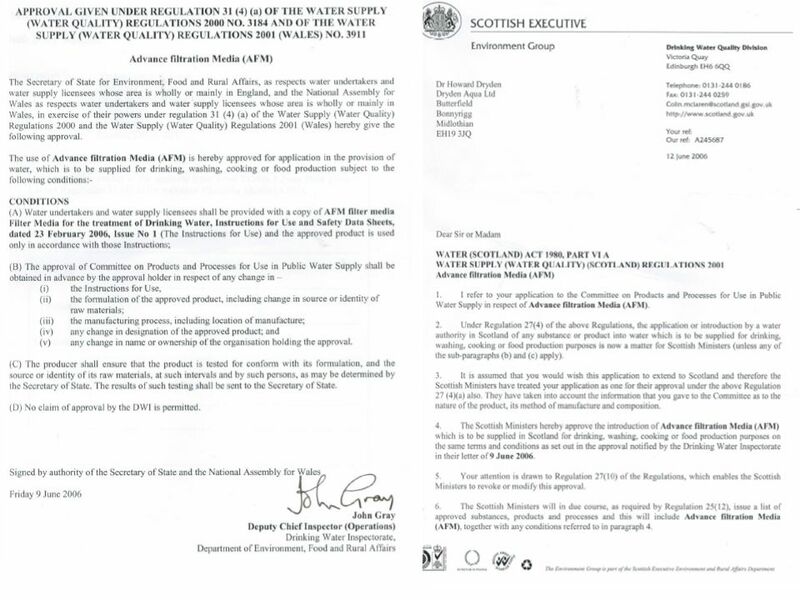 AFM back-wash video Scottish Water recommendations Certification under UK regulations Reg 31 for drinking water. 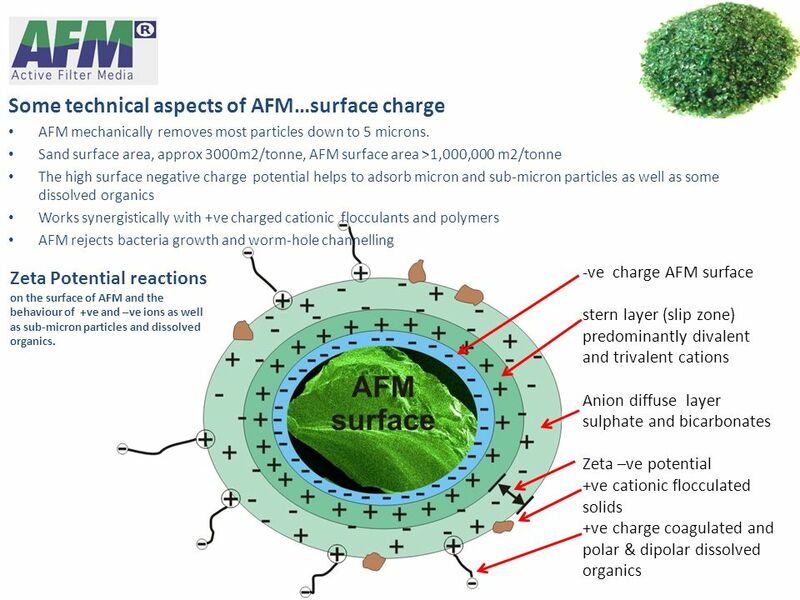 AFM is also compliant with NSF Reg 61. 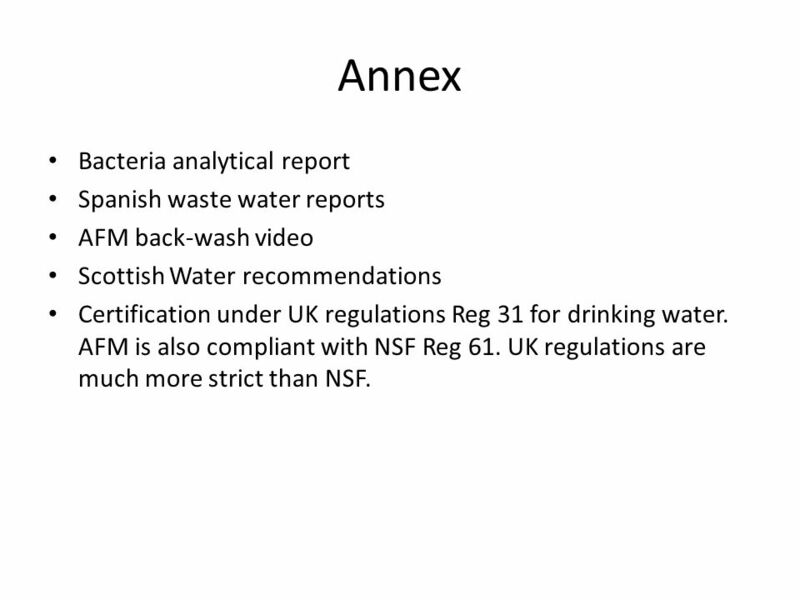 UK regulations are much more strict than NSF. 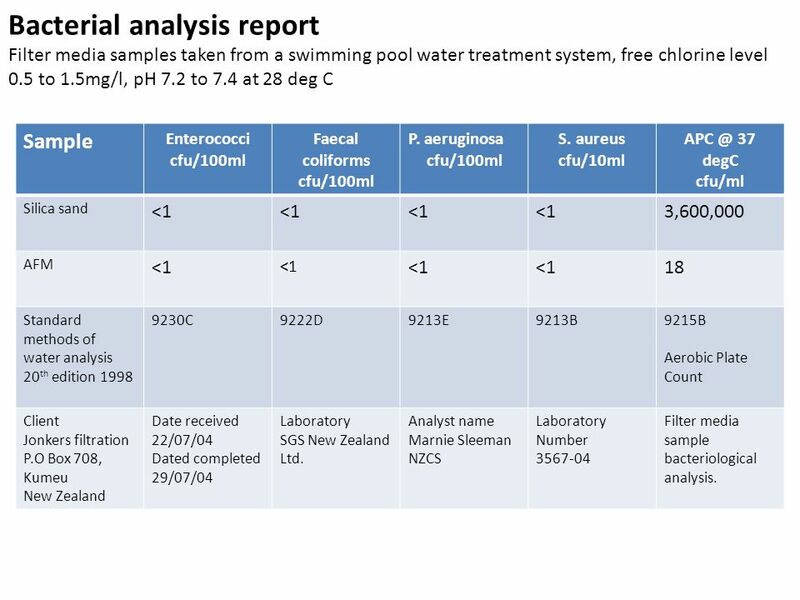 Bacterial analysis report Filter media samples taken from a swimming pool water treatment system, free chlorine level 0.5 to 1.5mg/l, pH 7.2 to 7.4 at 28 deg C Sample Enterococci cfu/100ml Faecal coliforms cfu/100ml P. aeruginosa cfu/100ml S. aureus cfu/10ml 37 degC cfu/ml Silica sand <1 3,600,000 AFM 18 Standard methods of water analysis 20th edition 1998 9230C 9222D 9213E 9213B 9215B Aerobic Plate Count Client Jonkers filtration P.O Box 708, Kumeu New Zealand Date received 22/07/04 Dated completed 29/07/04 Laboratory SGS New Zealand Ltd. Analyst name Marnie Sleeman NZCS Laboratory Number Filter media sample bacteriological analysis. 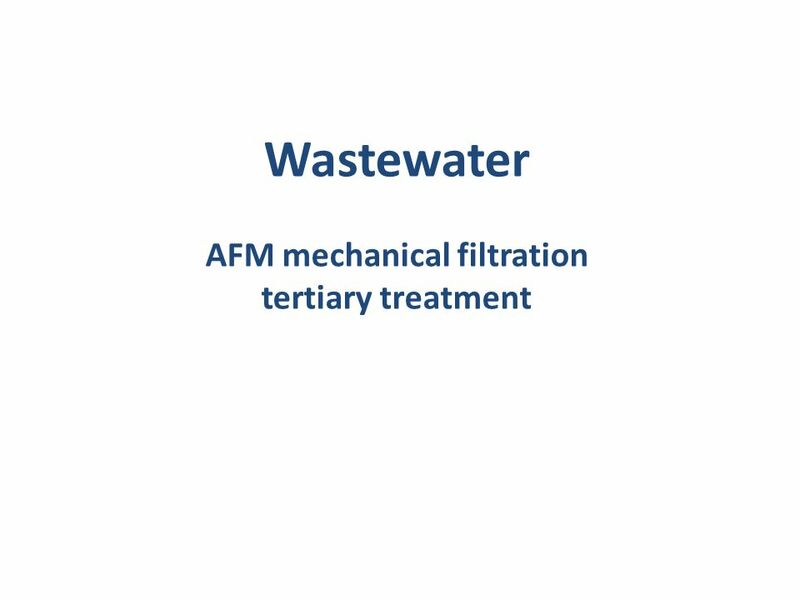 Download ppt "Clean Water Treatment Wastewater treatment." 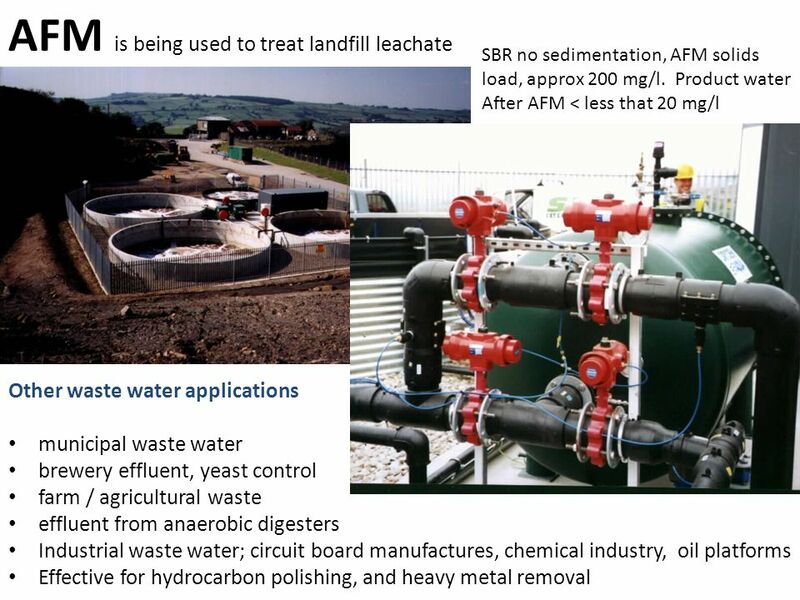 Case Study Polluted Open Evaporation Pond Recycled industrial effluent Reclamation Demo Plant 1000m3/Day Project objectives Production of Alternative. THE WORLD OF EUREKA FORBES. 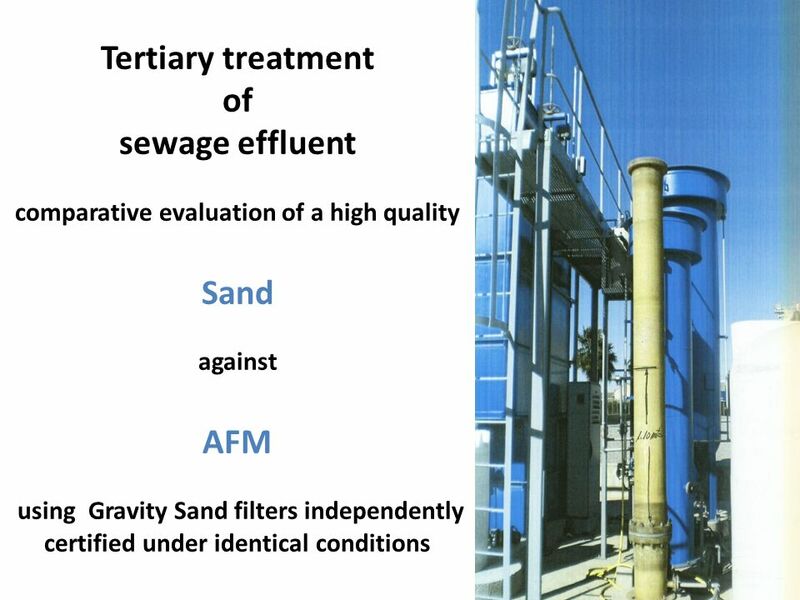 Wastewater Management at an Animal Protein Rendering Facility J.B. Hess, W.A. Dozier, J. Spann and B. Thomas Poultry Science Department, Auburn University. 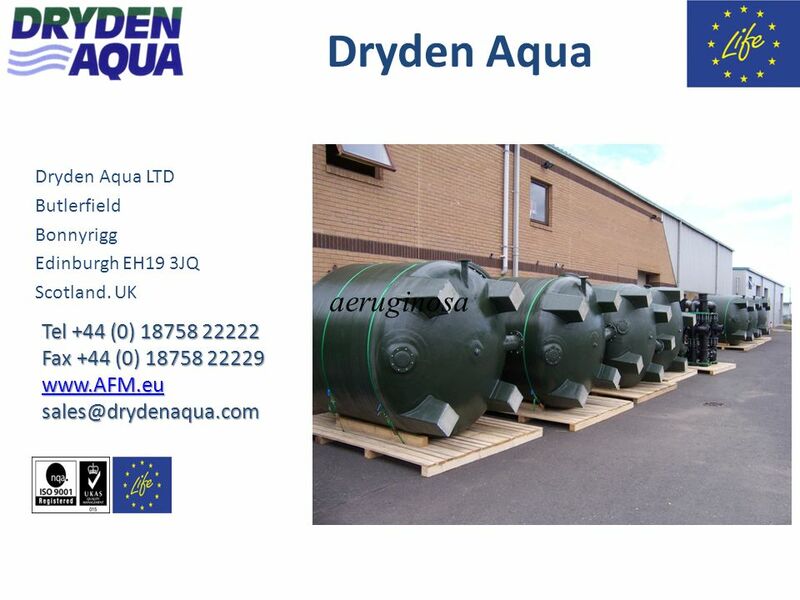 ACTIVATED CARBON Granular Activated Carbon may be used for a variety of water treatment applications requiring the reduction of chlorine, tastes, and odours. TRP Chapter Chapter 6.3 Biological treatment. 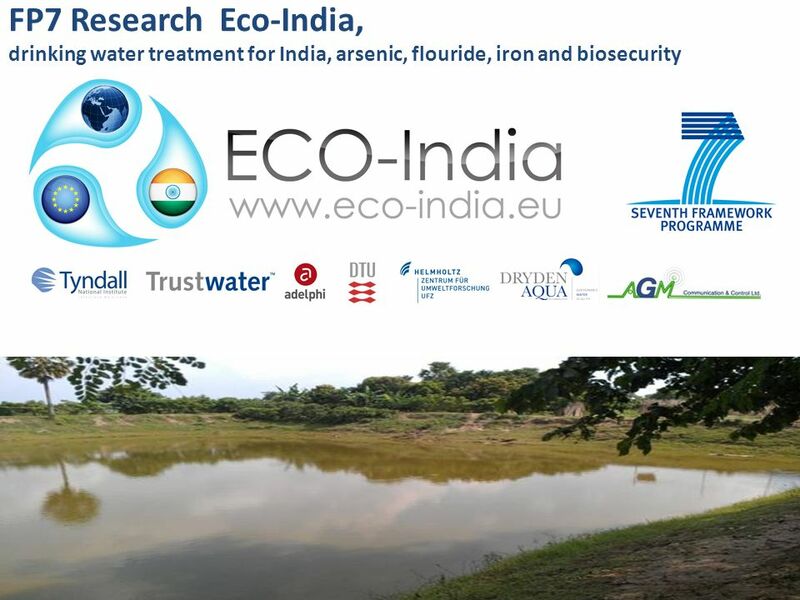 Previously Microbial survival in environmental media –Water, land, air Small scale sanitation, composting latrines, etc Conventional wastewater treatment. Sustainable Management of Scarce Resources in the Coastal Zone SMART ICA3 – Kick-off Meeting CEDARE, Cairo, 5-6 January, 2003 Case Study Jordan. Tirupati Water Solutions ugf-3,Super mall,Vikas Nagar,Lucknow,Mob : ISO 9001:2008 Certified ( The Complete Water Solutions) Technical Presentation. 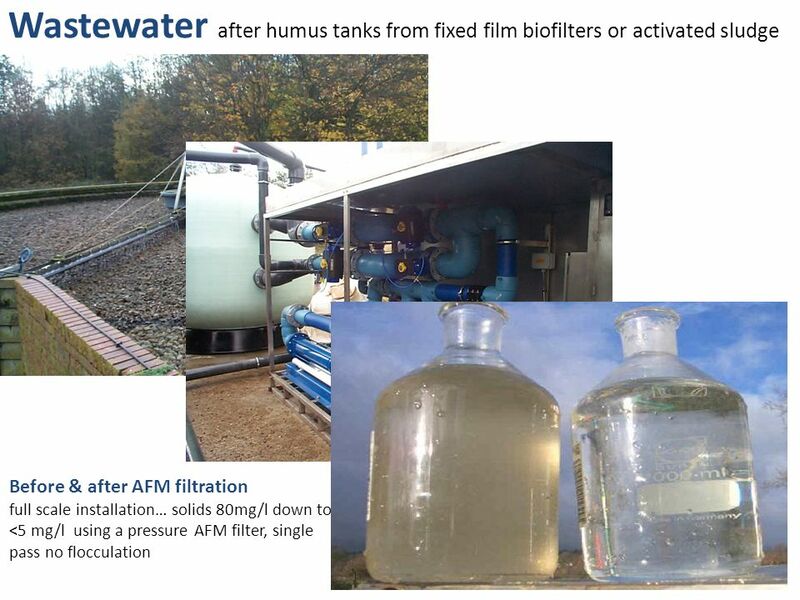 Filtration by Douglas Rittmann, Ph.D., P.E. Onsite Wastewater Treatment Systems Module 4:1. What is a Septic System? Module 4:2 Photo credit: MOEE. 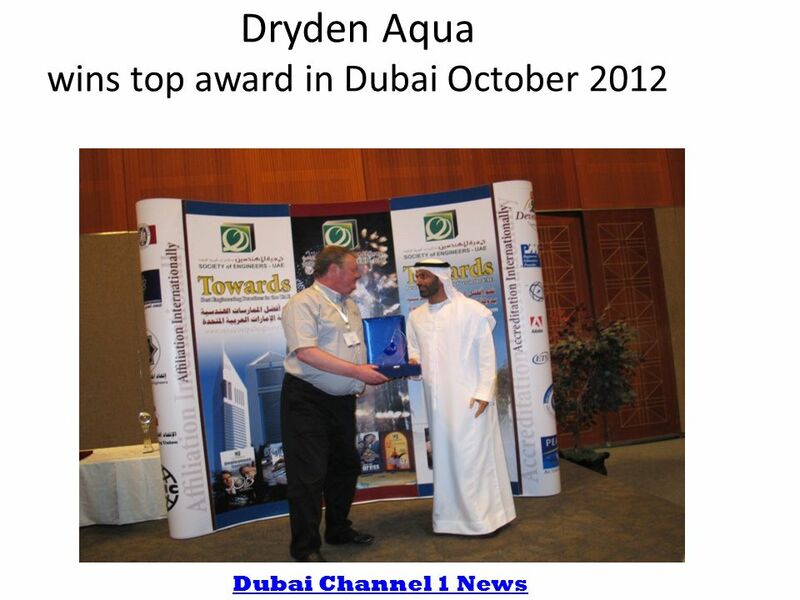 THE COMPARISON OF WASTEWATER TREATMENT METHODS AND THEIR USE FOR IRRIGATION Presented by: Michael Fynn Date: Tuesday 3rd September 2007.